Point spreads, also called “the line” or “the spread”, are margins used in sports betting to even the odds between two unevenly matched teams. The oddsmakers give each team a point total, predicting that the favorite team will win by a certain number of points (this is the point spread). The favorite is always indicated by a negative number next to their name (Yankees – 5.5) and the underdog is indicated with a positive number (Angels +5.5). If a player bets on the favorite, they win their bet if the favorite wins and the margin of victory is greater than the point spread. If a player bets on the underdog, they win if the underdog wins, ties, or if the favorite wins but can´t exceed the point spread. The standard for point spread bets in most sports is that the players win $110 for every $100 they wager. The over/under number that appears next to a point spread signifies how many points both teams are expected to score combined. The players can bet on both teams scoring more or less points than the predetermined amount. Here´s an example of a typical point spread in football: if a player bets on the Denver Broncos -5 and they only win by 4, 23-19, then the player would lose the bet. In this case, the Broncos must win the game by more than five points for the player to win the bet. Basketball is the other sport that sees plenty of action at a sportsbook with regards to betting against a point spread. 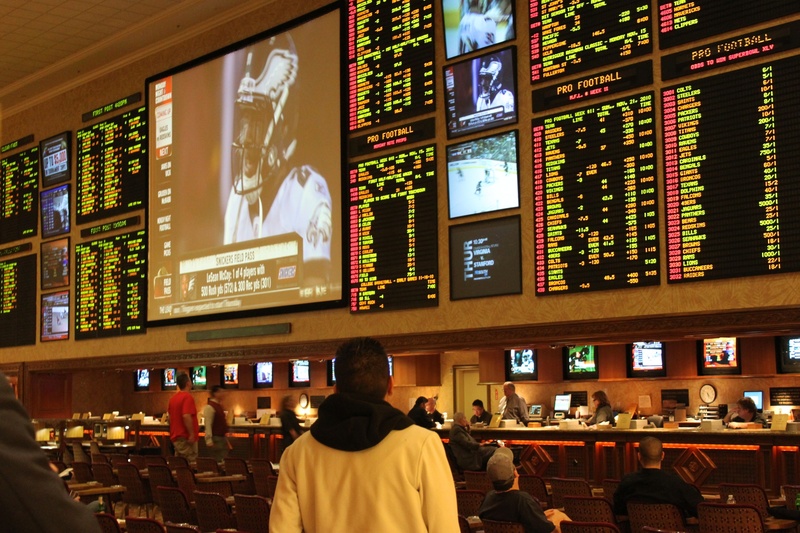 National Basketball Association and National Collegiate Athletic Association games will see the vast majority of this action, with the college game having the largest spreads as teams are often mismatched. As an example, let’s say the San Antonio Spurs are playing the Cleveland Cavaliers AT San Antonio. In 2007, the likely spread on this game would have been -7 in favor of San Antonio. This means that at the end of the game, you REMOVE 7 points from their final score. If their score still beats that of Cleveland’s, your bet is a winner. If deducting the 7 points gives Cleveland a higher score, Cleveland is the point spread winner and cashes the betting ticket. The term “push” when used in reference to a point spread means that neither team was able to win or to lose by more or less than the spread. An example of a push would be a team being favored by three points in a football game winning by exactly three points. In this case neither side was able to “cover” the spread, meaning nobody that bet on the game wins. In some gambling establishments, a push can be a desired outcome since nobody betting on that particular game wins money and the house gets to keep all bets. However, the rules must state that a tie loses for this to be the case. Other establishments will refund all wagers in the event of a point spread tie. The point spread was the brainstorm of a math teacher from Connecticut named Charles McNeil. He received a math degree from the University of Chicago and used to avidly attend and bet on Chicago Cubs games while in the city. He devised the idea of a point spread and opened his own sports book. Later, other gambling institutions copied his idea. The (-) before the 7 indicates that the Colts were the point spread favorites. The (+) indicates that the Bears were the point spread underdogs. If one were to bet on the Colts, the Colts would have to win by a total of 8 points for the bettor to win. If one were to bet on the Bears, the Bears would have to win outright or lose by no less than 6 points for the bettor to win. A 7 point victory by the Colts would equal a push or tie. The point spread – also called “the line” or “the spread” – is used as a margin to handicap the favorite team. For betting purposes, the oddsmaker predicts that the favored team will win by a certain number of points. This number of points is the point spread. The favorite is always indicated by a minus sign (e.g. -5.5) and the underdog without (e.g.5.5). If you bet on the favorite, you win your bet if the favorite wins AND their margin of victory is greater than the point spread. If you bet on the underdog, you win if the underdog wins, ties, or if the favored team wins but fails to exceed the point spread. It is standard for point spread bets in most sports that you wager $110 to win $100. A point spread is used in sports betting to even the odds between two unevenly matched teams. Each team is given a point total by the oddsmaker that can either be added or subtracted to the final score, thus factoring into if the bet was won or lost. In football, for example, a typical point spread might read as one team favored by six points. In this scenario the favorite must win the game by more than six points for anyone gambling on that club to win their bet. Conversely, the underdog must lose by less than six (or win) for their backers to collect.